Prosthetic Eye Lubrication | Ocular Prosthetics, Inc.
Prosthetic eye lubricants are suggested for most patients by our team of board certified ocularists. They are highly recommended for patients subject to prolonged exposure to the following conditions: air conditioning, computers, smartphones, wind, dry heat, extreme cold, smoke, and dust. These lubricants work to increase, or in necessary cases, mimic the human bodies natural tear production. Each lubricant works by coating the surface of the prosthetic eye; providing increased comfort, stimulating blinking, and maintaining a natural lifelike appearance. Although similar is size, each lubricant is uniquely formulated to deliver a specific type of relief. It is also important to know that prosthetic eye lubricants will only be effective when applied to a polished ocular prosthesis. For more information on which prosthetic eye lubricant is right for you, please contact Stephen Haddad, B.C.O., B.A.D.O. and his team of board certified ocularists. Ocular Prosthetics, Inc. is pleased to offer five different prosthetic eye lubricants, at each of our five greater Los Angeles office locations. These products are also available for purchase by phone by contacting our Los Angeles office. The descriptions of the prosthetic eye lubricants we offer are listed below. Sil-Ophtho – A special viscosity silicone oil. Helps control both the irritation and discharge from the socket. Available in a heavy and medium viscosity. Artificial Eye Lubricant – An all natural aloe vera gel, sunflower oil, and vitamin E lubricant. Tears Again Eye Ointment – A mineral oil and white petrolatum sterile lubricant. Provides long-lasting nighttime relief from dry eye symptoms. 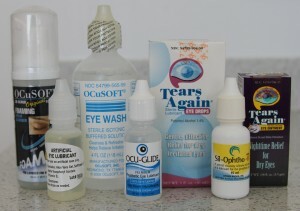 Tears Again Eye Drops – A polyvinyl alcohol sterile lubricant. For the temporary relief of burning, irritation, and discomfort due to dryness of the eye. Retaine – Preservative-free lubricant eye drops. Provides long-lasting relief for moderate to severe dry eyes.